I graduated from WCHS in 2010. I attended the University of North Alabama from 2010-2014 and graduated with a B.S. in Instrumental Music Education. This is my 4th year to teach. I am the music teacher and band director at WMS and WCHS. I am also currently teaching Bridge Math. I moved to Wayne County in the 5th grade and joined band when I started school here. I knew early on that I wanted to be a teacher. In the 7th grade, I decided that I wanted to pursue music. 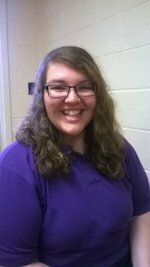 I began looking for the college I needed to attend to become a band director, and I chose to go to UNA. The band experience at UNA was phenomenal, and I am thankful that I had the opportunity to be a part of such an excellent organization. I did some substitute teaching after graduating in December 2014. Getting the job at WMS and WCHS in 2015 was literally a dream come true. I am grateful and excited to see what the future holds for the band program here. I am the daughter of Dion and Eleonore Pulley. They are both educators in the county. I have a brother who works for TDOT in Nashville and a sister who works in drafting in Parsons, TN. I love my family, and I enjoy spending time with them when I am able. My hobbies include reading, writing, playing and listening to good music, and spending time with my family and friends. My favorite author is Francine Rivers. I like to write and hope to have a book published one day. The trumpet is my primary instrument, but I also enjoy playing the other brass instruments. Kelly Clarkson is my favorite musician and artist. She inspires me to be creative and passionate about music in my professional and personal life. I am thankful to God for all of my family and friends.